Fresh, healty water from the tap and no more need for bottled water? Our drinking water systems enable you to drink water from your tap water without needing to worry about possible harmfull elements, bad tast and odor. Our professional reverse osmosis unit OC 750 with patented technology offers unique services in the market in terms of performance and maintenance. RO water will be used as cleaning water reducing considerably the consumption of soap and rinsing agents while improving the quality of the end result without need for additional wiping. equipment, professional kitchens, coffee machines, all gastronomic places (restaurants). Click below to download the leaflet 'Reverse Osmosis OC 750'! A complete PALLAS range of Domestic RO's for customers mainly interested in getting Reverse Osmosis water at tap and the more sophisticated PALLAS COMPACT range for thos who are ready to invest in a kitchen appliance combining high water treatment performance, long durability and modern design. The PRF RO Water Purifier, the reversed osmosis system for domestic and commercial use. The Everpure range, combining micro-pure and membrane filtration. Click below to download the chapter 'Domestic Reverse Osmosis' of our catalogue! 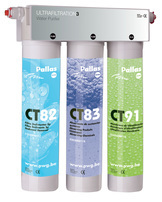 Pallas Trio UF, the ultrafiltration system with a membane, a sediment filter and an activated carbon filter. A compact system that is perfect to install under a sink.